My favorite thing I canned was dill pickles. These pickles were honestly some of the best dill pickles I had ever made. These were wonderfully spicy. I added crab boil to these pickles to give them extra flavor. These dill pickles are ones that you actually ferment. They take about three weeks to ferment, then it is time to can the pickles and get them ready for long term storage. If you have never had the opportunity to try fermenting your own pickles, I highly recommend doing so. 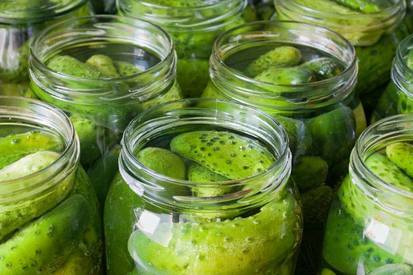 You will have a flavor that is so dense, that you will want to ferment your own pickles again and again. Combine all of the dry spice ingredients in a small bowl. In a large clean crock or glass or stainless container, place half of the picking spice and one bunch of dill. Add cucumbers, leaving at least 4 inches of space between the cucumbers and the rim of the container. In a large stainless steel saucepan, combine pickling salt, vinegar and water. Bring to a boil and add salt stirring to dissolve. Remove from heat and let cool to room temperature. down with a couple of quart jars filled with water and capped. Cover with a clean towel. Let stand in a cool place the temperature should be about 70 to 75 degrees, let stand for about three weeks. It will take about three weeks until the cucumbers are well flavored and the fermentation is completed. You will need to check the brine daily and remove any scum that may form. During fermentation bubbles will form. After about three weeks it will be time to put up the pickles. Prepare your canner, jars, and lids. Drain pickles reserving the brine. Strain brine through a sieve and pour brine into a large stainless steel pot and bring the brine to a boil. When a rolling boil has been achieved reduce heat, an let simmer for 5 minutes. Pack pickles into the hot jars leaving 1/2 inch for head space. Pour hot brine into jars, leaving 1/2 inch head space. Remove air bubbles and adjust headspace if necessary, by adding hot picking liquid. Wipe rim. Center lid on jar. Screw band down until resistance is met, then increase to finger tip tight. Place jars in canner, ensuring they are completely covered with water. Bring to a boil and process for 15 minutes. Remove canner lid, wait 5 minutes, then remove jars, cool, and store.